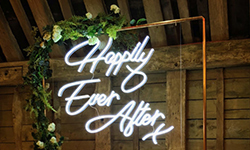 Our white neon Happily Ever After sign, hanging from a polished copper frame. Real neon lighting mounted on perspex. 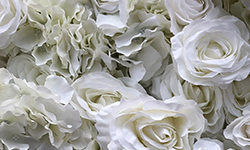 We are happy to work with your florist to customise this item. 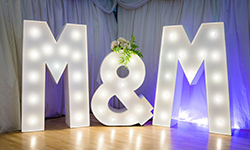 Currently available to hire for venues in Hertfordshire and North London only. 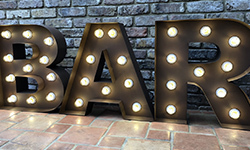 Our neon sign is for hire with the copper frame and is set up and collected at a time to suit you. It is not suitable for outdoor events. We can supply as many extensions as you need. All are products are PAT tested and we hold Public Liability Insurance. 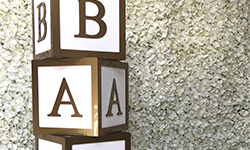 We will install and de-rig the display from your venue. 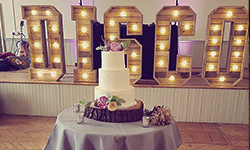 Available to hire in London and Hertfordshire. To find out if we can help you, please don’t hesitate to contact us.